^ Pakistan is producing its own UAVs....they have taken the step but it's a bit slow. I know about Pakistani UAVs. I am talking about engine development. I do not know of any small scale turbojet engine made in Pakistan, like the Iranian one shown a couple of posts back. easy access to global market for UAVs, barring the very big ones explains our lack of interest in home grown drones. Armament: 2 x Misagh-1 MANPADS flight cap from 3500m to 5500m, and its carrying capacity to 80 to 100kg,This missile is 1.65 in length, and can reach at 5000m range, 4000m flight cap, and twice the speed of sound when launched from the surface (660m/s), which would be improved when launched from aerial platform. Being gifted to Russian Air chief, Colonel General Viktor Bondarev by Brig. general Amir Ali Hajizadeh, commander of IRGC aerospace force. Images taken by Yasir of foreign forces in Afghanistan inside Afghan territory. Mohajer was first developed at the peak of the Iran-Iraq war. Studies started between 1980 by Iranian universities and IRGC as Iran needed surveillance equipment to gather information about Iraqi moves. Four prototypes were built in 1981 and were initially put into service to monitor the enemy lines in Shalamche. This drone which was later named Mohajer 1 was Iran's first step to manufacture UAVs. Mohajer continued to photograph Iraqi lines to the end of the war and accomplished 619 sorties at the end. Mohajer 1 was armed with six RPG-7 rockets to attack enemy positions, making it the first UCAV used in War. Following the successful use of Mohajer 1, Iran wanted a version with more range and endurance to monitor distant unreachable places. The version which was later named Mohajer 2 also had an auto pilot system to help it in its missions in places far from the reach of radio waves of command center. Its body was completely built with composite materials. Mohajer 3 (also called Hodhod) was developed to further increase the range and endurance. The body was redesigned to achieve this goal. Mohajer 4 was later designed for both Iranian Army and IRGC. The body was again redesigned and better cameras were installed on the drone. Range and endurance were increased much more. There are two other variants of Mohajer 4 called "Hodhod A/100" and "Shahin". Engine used in this Drone is WAE342 or 3w engines. In 2010, US satellite images revealed a Venezuelan facility that is reported to be manufacturing Iranian drones. Later, Venezuela unveiled a drone called SANT Arpía which is identical to Mohajer 2 except that it uses skids to protect the camera during the parachute recovery. This feature was only seen on Mohajer 4. According to some sources, Venezuela signed a $28 million contract to manufacture Mohajer 2 despite sanctions that prohibited Iran from exporting arms. 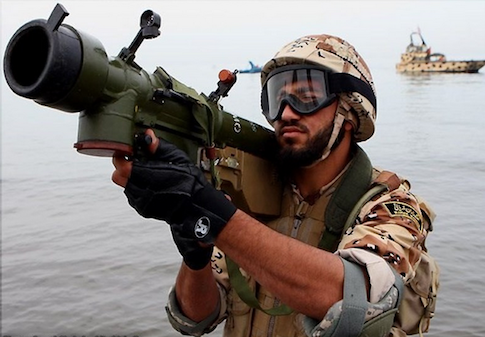 · Mohajer-1: Initial variant developed during Iran-Iraq war. · Mohajer-2: Slightly better range. Addition of auto pilot systems. Had an endurance of 1.5 hours and range of 50 km. · Mohajer-3: Features a more box shaped body that is different from cylinder shaped bodies of Mohajer 1 and 2. With a range of 100 km and endurance of 2–3 hours. · Mohajer-4: Body is again redesigned and features low mounted trapezoid shaped wings with upward wingtips to lessen the drag. Operational range is increased to 150 km, altitude to 15000 feet and endurance to 7 hours. The weight of the drone is almost double of the older versions. There are two sub-versions with unknown differences called "Hodhod A/100" and "Shahin"
There is a series of mini turbojet variants produced by IACI, in 4-10 KN class ... Tolue-4 powers Karrar UCAV (at ~4 KN with MTBO of 20 hours) and Noor AShCM (Iranian C-802/3 variant) ... Tolue-5 probably powers Ghader AShCM at ~ 5 KN with MTBO of 100+ hours and is throttleable ... MALE UCAV's like Fotros and Shahed-129 are powered by bigger wankel powerplants. Now this s300 variant should be produced in high quantities to ensure deterrance. It would also protect airbases from cruise missiles and to an extent ballistic missiles. Even abm capability is questionable it is the first step and the rest will follow with faith and hard work. I think before it is too late instead of relying totally on nuclear assets Pakistan should also work with China on high altitude sams. Naval forces for example are unprotected against high altitude long range targets if no high altitude system is present and considering the long range of anti ship missiles enemy aircraft can easily make hit and run attacks without your planes if any that can cover the navy catching them. Also static airfields that can be detected from satellites are the primary targets and all aircover will be gone once taken out by conventional cluster bms. Other than taking out enemy planes sams to a degree can protect the airbases from cm and bms. Also with inflating decoys and frequent change of positions satellite pictures are useless unlike airbases. your military officials made a mistake by not equipping with sams till today and whoever has influenced them by excuses like it is expensive and planes can replace sams type of arguments are not thinking what is good for you but what is good for themselves actually.